What are the best Coleman tents to buy? How to pick out a single Coleman tent? It is not simple to find the right Coleman tent for yourself, particularly when there are 63 to choose from. To make things a lot simpler I decided it best to divide them up into more manageable groups. With prices ranging from $26.30 up to $399.99 and sizes ranging from 28 sq ft up to 170 sq ft. I figured it best to create 5 different sections where you can compare like with like. Start by picking one of the sections below that best suits you below. At the bottom of the page you can find a list of the top ten. Start by selecting one of the sections below. Seven of the sixty-three tents have what one could consider great ratings along with lots of reviews. This section is primarily made up of larger pricier cabin tents and smaller dome tents ideal for those on a budget. The one with the best overall score is Coleman's Sundome 2 The top five positions are dominated by three of Coleman's extremely popular Sundome model. The 3 person version sits in the second place and the larger 4 person model is to be found in fourth place. All three can be purchased for around $50 the difference in price between the three is next to nothing. 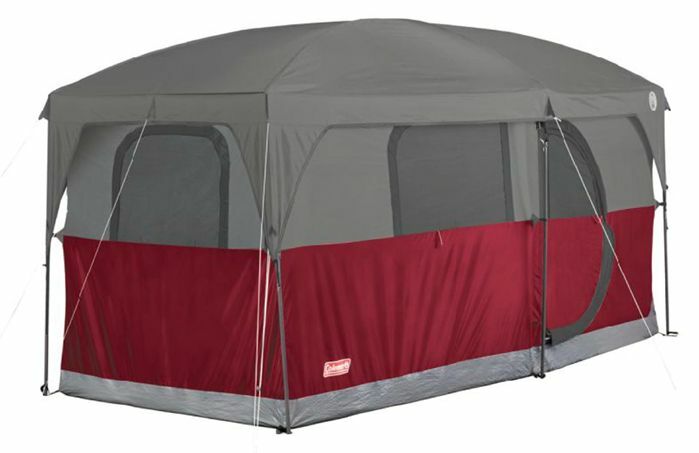 With this in mind, and assuming you are not considering purchasing it based on their weights, the Sundome 4 "pictured below" is always going to be the best buy with near double the sleeping area of the smallest, for just a few extra few dollars it makes a great deal compared to the smaller versions. 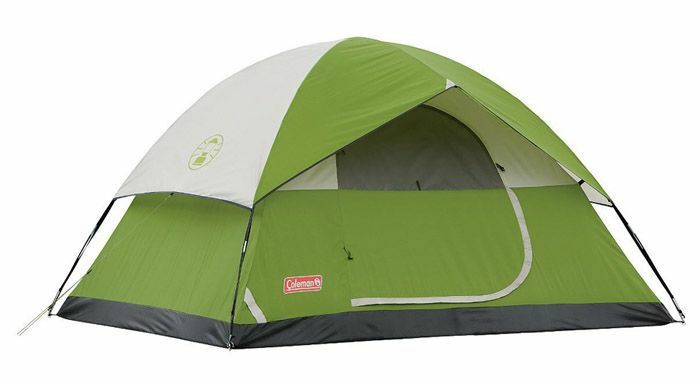 Coleman's Sundome 4 ideal for two people, priced right around the $50 mark. Slipping into third place is Coleman's original 4 person Instant Tent Even now after the introduction of many more Instant tents in all shapes and sizes over the last few years, it continues to beat out the competition and newer versions. 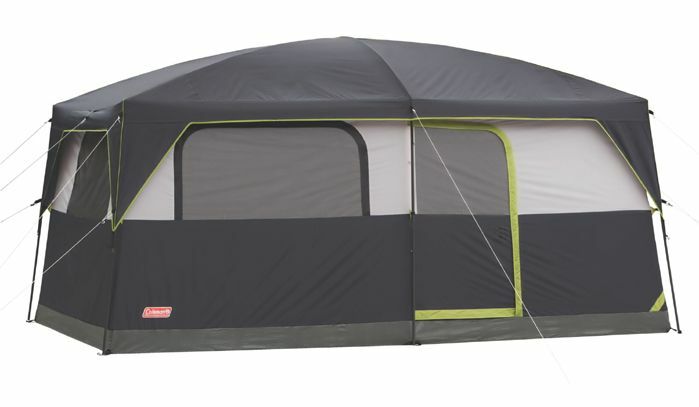 It is a little small for four people with only 56 sq ft compared to the Sundome 4, which has 100 sq ft Personally I am not a fan of the whole Instant Tent craze, half the space for double the price just does not add up, if it is just to save ten minutes setting up a tent a few times a year. That been said campers love this tent and the larger versions, and seem quite happy to pay extra for the convenience it offers. The larger 6 person version is better suited to families of four. It also has great ratings. Both are sold without a rain fly, which you will need to purchase. Rounding out the top five is the Hampton 6 "pictured below" This cabin tent is one of Coleman's most recent additions. It has been received well and has quickly started to get a good reputation for been easy to setup and spacious, the hinged door is another extra people really appreciate. Size wise it is not a huge 6 person tent with only 90 sq ft It does though have lots of headroom, It considerably smaller than the Big Horn 6 which has 150 sq ft and is largest of all the 6 person tents The Hampton 6 is probably best suited to groups of four planning on camping for a few weeks at a time wanting a couple of rooms and a little extra space. 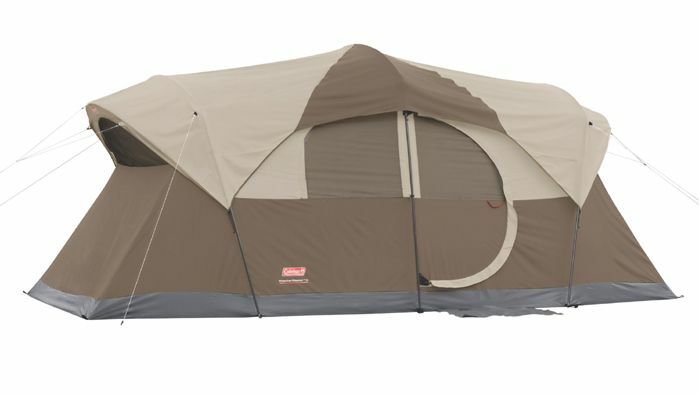 Even though it is the most expensive of all the Coleman Tents at its current price of $399.99 info_outline it is a lot cheaper than many other 6 person tents. The Hampton 6 with two rooms gets very good reviews and is Coleman's most expensive tent. Another of Coleman's newer two room cabin tents is the Prairie Breeze 9 "pictured below" It is also getting very good reviews. A lot cheaper and also larger than the Hampton 6 "above" it looks good for those wanting more space and headroom without the extra cost. With 140 sq ft and 7' of headroom it will easily accommodate six, nine people sounds like a push unless it is nine children. The Prairie Breeze 9 is a large cabin tent ideal for 6 not wanting to spend a fortune. 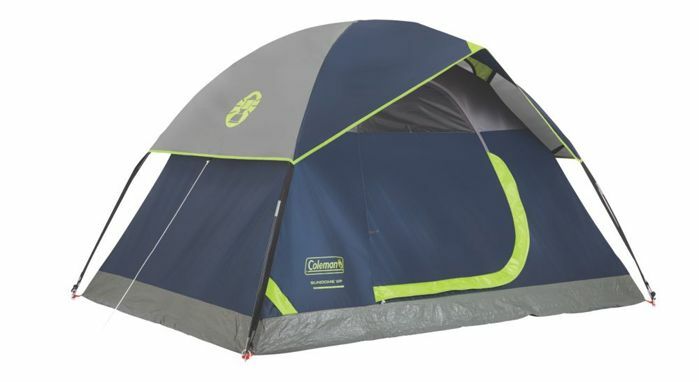 Another that deserves an honorable mention is the Octagon 98 It gets great reviews and looks to be one that will be around for many years to come, you can read more about it in the largest Coleman tents section. 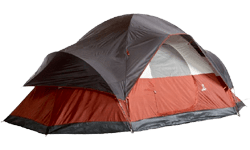 In this section you will find a number of tents that are what could call "well rounded" generally speaking they have better than average ratings, most are what you would call mid sized. One thing they all have in common is a low price per square foot compared to other Coleman tents. The average price per square foot of all the Coleman tents is just $1.43 info_outline "significantly less than other brands" all the tents below fall right around or under that average price per sq ft, they are not huge or the cheapest of all the Coleman tents. One of the older models the Evanston 8 offers outstanding value. Like most all tents the suggested number of people it can accommodate is overstated by the manufacture. With 144 sq ft it would be tight for eight, six would be comfortable. It is a great tent that was introduced many years ago and continues to sell well, even after many years. With a decent porch area it offers a lot of space for only $139.00 info_outline For just a little extra the newer Evanston 8 Screened is well worth considering and is hugely popular. Slowly but surely Coleman appears to be phasing out its Elite version of some models, differing in color to the standard versions they are easy to spot, as they are all colored navy blue and white compared to the standard green and white colors used for many years on the old Coleman favorites. Both the Elite Sundome 6 and Montana 8 offer great value at their currently discounted prices. Both have hinged doors Of the two the Elite Montana 8 currently $159.00 info_outline wins hands down, it is a quality tent and when discounted below $200 is a steal. One of the newest Coleman models the Octagon 98 again slides into another section. 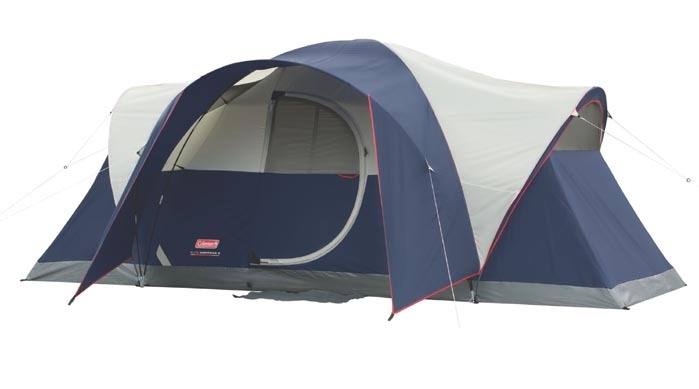 It is a great all round tent that has a lot of qualities. After the Instant tent came the Fast Pitch tent both terms created by Coleman the Echo Lake Fast Pitch 8 with Cabinet is a good looking tent and one that drops into more than one section on this page. With not a lot of reviews and a mixture of ratings the jury is still out on this one. On the price and size fronts it scores well and incorporates extra storage space in the form of two cabinets "that you can see below" At its current price of $329.99 info_outline It looks like a better choice would be the trusted Weathermaster 10 that has been around forever and is loved by thousands of campers. Comparable in shape price and size, the Weathermaster would get my vote. Coleman's Echo Lake 8 fast Pitch with cabinets is one of their newest tents. The Red Canyon 8 is another that features in this section. 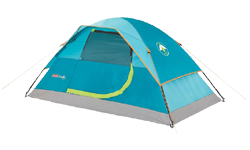 It is a large tent, cheap and the most popular overall, extremely good value. Less than 10 of the 63 Coleman tents have 140 sq ft or more. Largest of them all by a single square foot is the Red Canyon 8 it also an extremely popular tent with over 2,000 reviews. 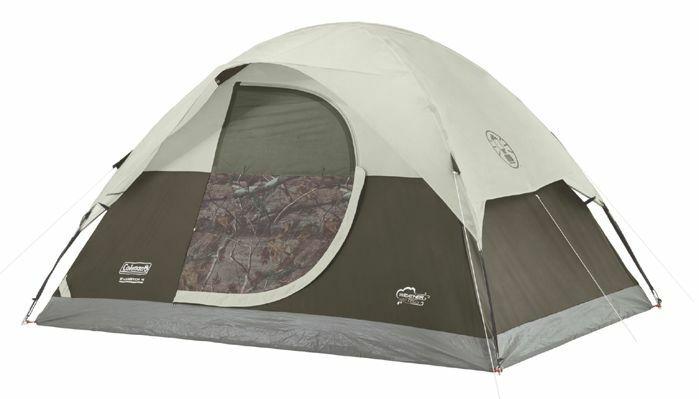 One of the funny things about this tent is I have not seen it on the Coleman Website in the last few years, yet it continues to sell year after year. Available in three colors there appears to be no difference between any of them, the original is the red one. Dividers allow you to turn it into a three-room tent. It is neither a cabin tent or a true dome described as a modified dome it does not offer as much headroom as a cabin tent it does though cost considerably less priced at $109.99 info_outline ideal for a large family not wanting to invest a whole lot the Red Canyon 8 is tried, tested and proven. 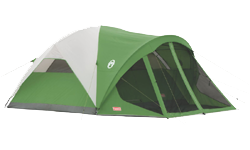 Coleman's 2 Room Octagon 98 with an included half fly is getting rave reviews. Smaller by just a single foot is the all new Octagon 98 as suggested it has eight sides. It is spacious with 169 sq ft and has a lot more headroom than the Red Canyon 8 not only at the center but also through out the interior. The included steel poles make for a strong and sturdy tent able to take a beating in storms. With two large zippered doors and two windows nobody is complaining about ventilation. It is a heavy tent weighing in at around 40lbs It is possible to set it up on your own, two is better though. A half fly is included and appears by all accounts to be doing a great job at keeping the rain out, with no reports of leaks. All in all the Octagon 98 appears to be a slightly better quality tent than the Red Canyon 8 needless to say it does cost a little more. Is the extra $100 worth it? If you are taking long trips at the beginning and end of the 3 seasons probably yes. It will keep you warmer and provide more protection in the spring and fall. 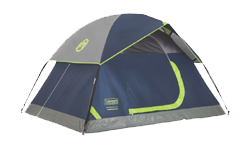 If you are looking for a large decent quality tent from Coleman at its current price of $159.99 info_outline the Octagon 98 is an easy choice. 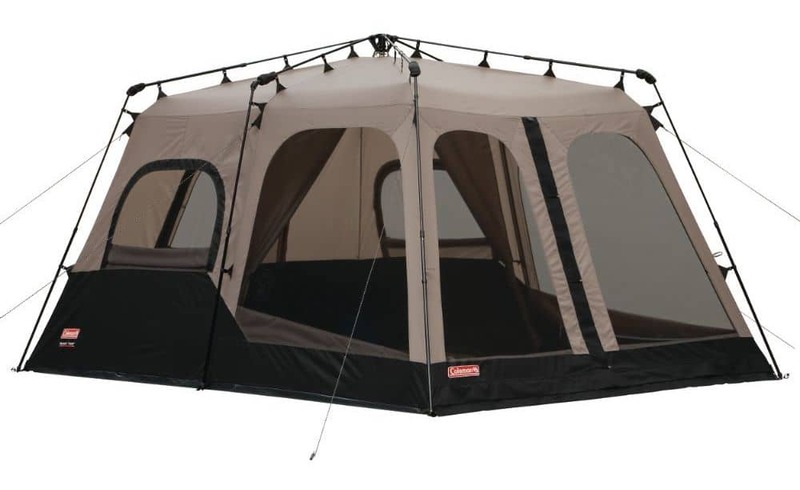 Coleman's dependable Weathermaster 10 with an included rainfly and room dividers. The Evanston 8 is the last of these larger Coleman tents. The standard version has 144 sq ft of sleeping space and is easy to setup, it is also great value costing just $149.00 The newer Evaston 8 Screened is a little smaller, the porch area is screened though. 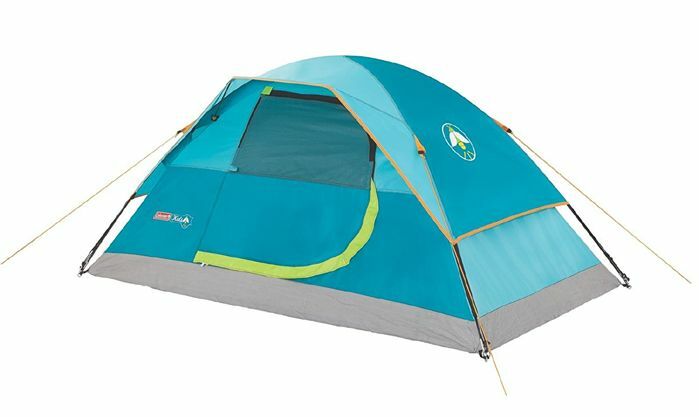 10 of Coleman's tents have a suggested retail price of less than $100 You can often find another 10 or so, that with discounts fall into this category. Rather than just playing safe and highlighting those that are always cheapest. I have added a few that I regularly see discounted. Starting of with the cheapest of all, we find the Kids Wonder Lake Like suggested in the name it is designed primarily for children. 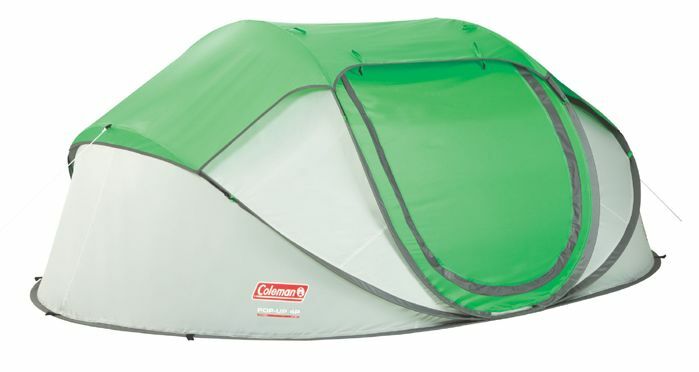 In the "picture below" you can see it is not a toy tent, it can be used outside just like any other Coleman tent and comes with a half fly. Costing less than $50 and small in size it is best kept for younger children who would like a tent of their own to sleep in. The Kids Wonder Lake 2 Simple setup in about 10 minutes, normal Coleman WeatherTec system. All three of the smaller Sundome model can be found for right around $50 on a regular basis, I have covered these in more detail in the top rated section above as they all have great ratings. 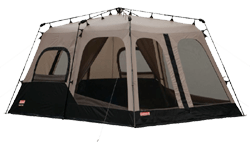 The one that is a surprise is the much larger Sundome 6 It has 6' of headroom, 100 sq ft of sleeping space and is often discounted to less than $100 Making it easily the largest in this category. 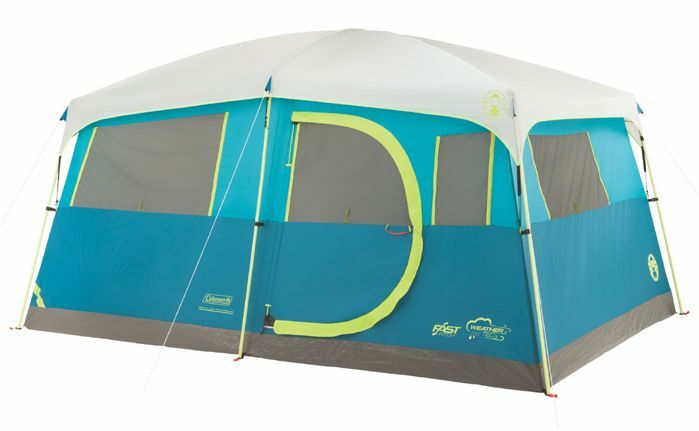 Introduced in 2014 Coleman's Pop up Tent is available in two different sizes. They have lots and lots of reviews with good ratings. Campers seem to purchase it uniquely for its extremely fast setup and breakdown time "under 30 seconds" the smaller Pop Up 2 is ideal for a solo camper, it is a tad small for two. As the Pop Up 4 is only an extra few dollars it would be a great choice for a couple. Coleman's Pop Up 4 Under a minute to setup and breakdown, great for festivals. The Longs Peak Fast Pitch 4 and 6 are another of Coleman's newer models the smaller one has a suggested retail price of $99.99 so it is no surprise to find it here the larger Longs Peak Fast Pitch 6 looks to be much better value and is occasionally deeply discounted below the $100 mark. When it is it looks to be an interesting buy. The Flatiron is advertised as an Instant Dome Tent that only takes 30 seconds to setup. Available in 3 different sizes all look to be on the small size as is often the case with Instant Tents. Introduced quite recently it is not getting any rave reviews, of the three the Flatiron Instant 4 seems to be getting the best reviews. The Moraine Park Fast Pitch Dome 4 was introduced in 2016 it has not got a lot of reviews, those that it does have are generally very good. Many of these newer dome tents another is the Aspenglen 4 all seemed to be modeled after the original Sundome 4 which is near always cheaper tried, tested and considerably less at its current price of $41.99 info_outline than the newer models. Lastly Coleman appear to have teamed up with Realtree to market a new camouflage tent. Available in two versions the Realtree XTRA 4 looks to be exactly the same as the Standard Evanston model, the only difference been the colors. An old favorite the Evanston gets a new name the "Realtree XTRA 4" along with camo colors. The popularity of the Coleman Brand is unquestionable this is backed up by the fact that nearly half of the tents have more than 100 reviews, some even run into the thousands as you will see below. With more than 2000 reviews the Red Canyon 8 looks to be the most popular and largest of all the Coleman tents Costing a little less than $1 per square foot it is easy to see why people are drawn to it. For the most part reviews are very good. Available in three different colors the original version appears to be the red one, that crazy as it may sound gets a lot more praise. With room for three queen sized mattresses it is ideal for large families not wishing to invest a fortune in their first tent. 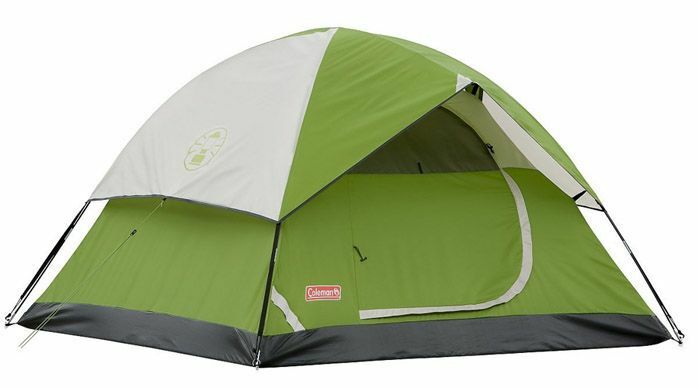 Available for less than $150 Coleman's Red Canyon 8 is the largest of all their tents. When Coleman introduced their first Instant Tent to the world back in 2013 I was a little skeptical it was smaller than similar tents and quite a lot more money. The original Instant 8 has over the years has become an all time favorite along with the more recent Instant Cabin both have huge followings with great ratings. Costing a little over $200 the Instant 8 has 140 sq ft of sleeping area along with 6' 5" of headroom. Setup is quick and easy as the name suggests it is also available in smaller the sizes. The Instant 6 also falls into this best selling group, it is quite a lot smaller and only a little cheaper making the larger 8 person version a better buy. If your looking for a large dependable, easy to setup tent Coleman's Original Instant 8 tent "pictured below" looks like a good choice. 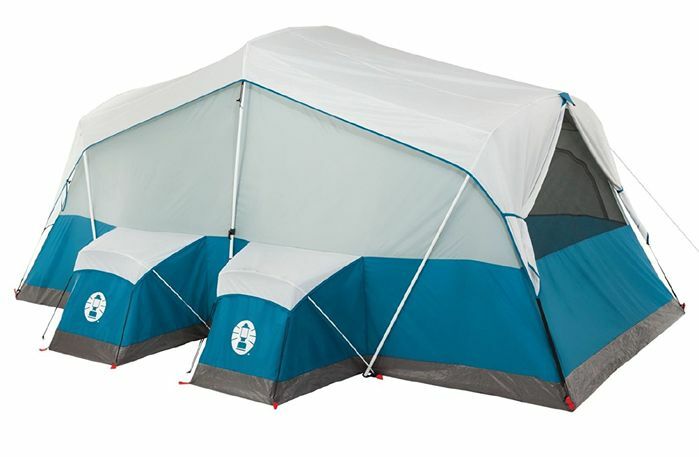 The original Instant tent introduced by Coleman sets up in a few minutes and is loved by many. The Sundome 4 introduced back in 2011 continues to offer outstanding value. More than 70% of buyers give it 5 star ratings. It is a small dependable tent that only costs around $50 less than a couple of night in a cheap motel. All of the Sundome tents score well of the three smaller ones this 4 person version is easily the best offering a decent amount of space for a couple. A lot of the more recent additions are all modeled after the Sundome none offer anything near the value this one does. Ideal for couples even those with a small child at the current price of $41.99 info_outline it is one of the safest choices on the market today. The Montana 8 is another of one of Coleman's Classic models that have stood the test of time. 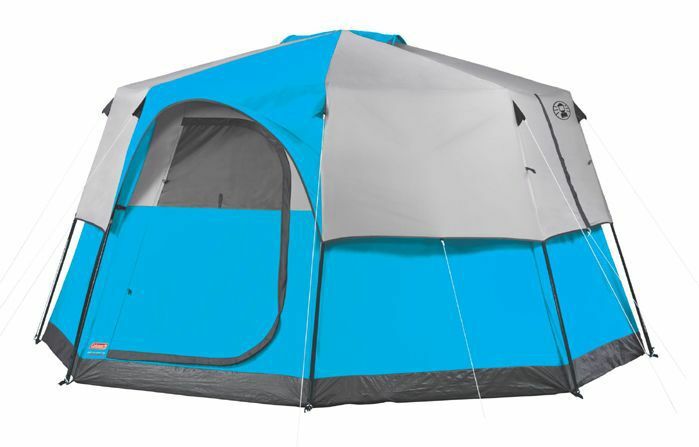 It is has got into this section mainly because of the length of time it has been around, "since 2009" With its hinged door and covered entry and it's current price of $124.39 info_outline it is a nice tent for smaller families that want an affordable tent that is not going to let them down. Of all the recently introduced models only the Tenaya Lake Fast Pitch 8 seems to have hit the ground running. 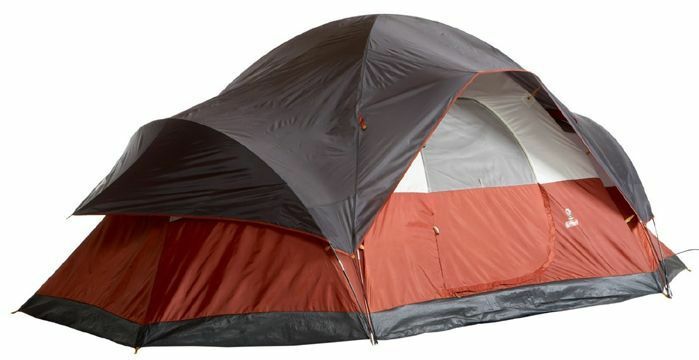 One of the pricier Coleman tents currently $184.75 info_outline has got good reviews from day one. With 6' 8" of headroom and 121 sq ft it's a decent sized tent advertised as "fast pitch" somewhere between the Instant Tents and the older more classic designs. The Tenaya Lake Fast Pitch 8 is one of the newer models that has been well received. Both the Evanston Screened tents are hugely popular. The smaller 6 person tent has been one of the best selling tents on this website for the last two years. Offering a decent amount of space and a screened porch area to keep the bugs out. The 8 person version is not a lot bigger, considering the extra it costs the Red Canyon above looks to be better value if you want something bigger. Each of the five sections above is a summary of the tents that rank well in those particular groups. Reading through each, you will notice that some tents rank well in more than one category, some appear in only a single category, and some are obvious winners in only one category. Each time a tent ranks well in any of the five different categories, it gets a few points, the more sections and the higher up a tent appears, the more points it gets. This is how the top ten list shown below, is created and updated daily. Top position overall goes to the Red Canyon made by Coleman. It is also the winner of the Largest Category It makes an ideal choice for families looking for a great tent on a budget. Height 6 ft. 00 in. Second position overall goes to the Sundome 2 made by Coleman. It is also the winner of the Top Rated Category It makes an ideal choice for couples looking for a great tent on a budget. Height 4 ft. 00 in. Sliding into third place overall is the Octagon 98 made by Coleman. It is also the winner of the Best Value Category It makes an ideal choice for families and those looking for a tent that will last many years. Height 6 ft. 10 in. Dropping into the fourth place overall is the Sundome 4 made by Coleman. It makes an ideal choice for couples looking for a great tent on a budget. In fifth place we find the Sundome 3 made by Coleman. It makes an ideal choice for couples looking for a great tent on a budget. Height 4 ft. 04 in. Heading up the second half of this list is the Weathermaster 10 made by Coleman. It makes an ideal choice for families and those looking for a tent that will last many years. Height 6 ft. 08 in. In seventh place we find the Kids Wonder Lake made by Coleman. It is also the winner of the Cheapest Category It makes an ideal choice for couples looking for a great tent on a budget. Height 3 ft. 00 in. Sliding into eighth place we find the Instant 8 made by Coleman. It makes an ideal choice for families and those looking for a tent that will last many years. Height 6 ft. 05 in. Sneaking into the last but one place we find the Elite Montana 8 made by Coleman. It makes an ideal choice for families and those looking for a tent that will last many years. Height 6 ft. 02 in. Last place on the list goes to the Instant 4 made by Coleman. It makes an ideal choice for couples looking for a great tent on a budget.